This is how the Evidence Group's Footprints came about. 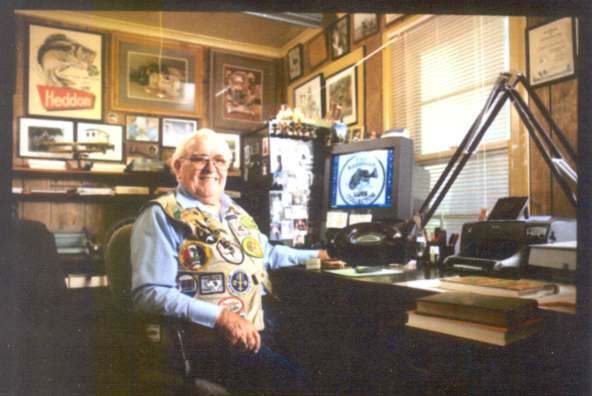 On October 29, 2001 Mr. Lanny West, Senior Director of Marketing and International Sales, PRADCO Outdoor Brands, Ft. Smith, Arkansas called Mr. Clyde A. Harbin Sr. and asked if he would speak with Mr. Hiro Naito who he had in his office. 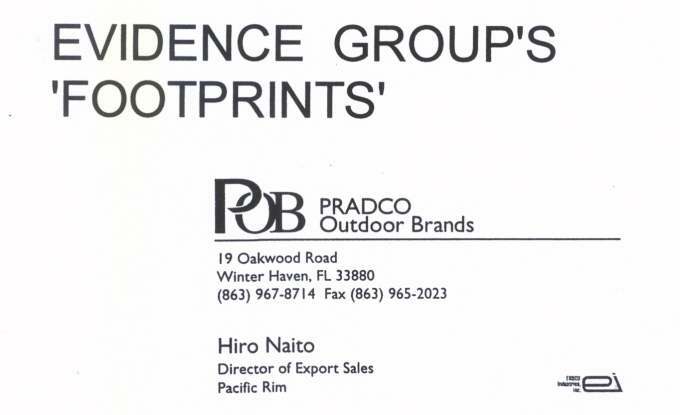 (Mr. Hiro Naito is responsible for all of the marketing, sales and advertising of all PRADCO lure brands in Japan). 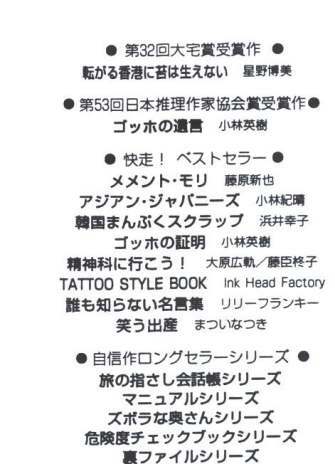 Mr. Hiro Naito asked Mr. Harbin for an interview with him for a Japanese magazine article. 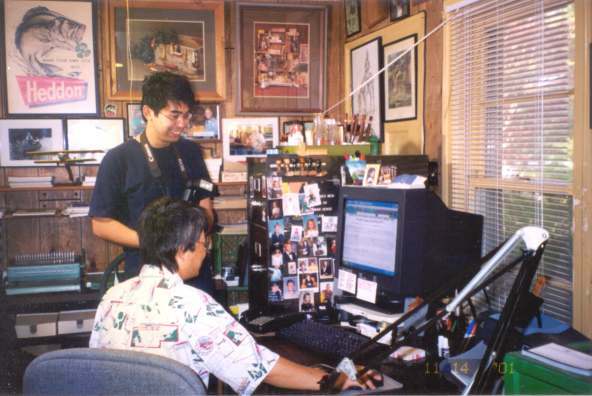 They set the interview for 9AM on November 14, 2001 at Mr. Harbin's home. Mr. Hiro did not declare a subject matter but as any eager one for new friends Mr. Harbin quickly accepted this valuable request . 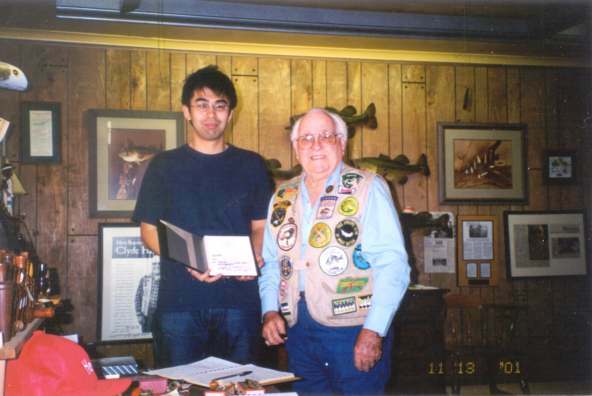 Mr. Hiro Naito, Director of Export, Pacific Rim, Poplar Outdoor Brands, PRADCO, Ft. Smith, Arkansas is signing the Bassman's Guest Register. 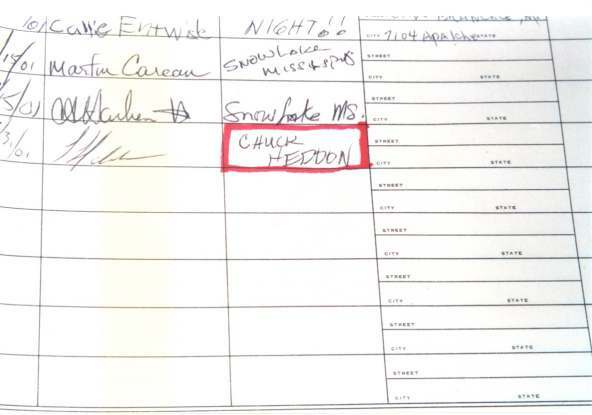 Note Mr. Chuck Heddon signature, the Grandson of W. T. and Laura Heddon on July 31, 2001 in Mr. Harbin's guest register. So marked for the Japanese visitors to sign in with another visitor of whom the visit may write thereof. 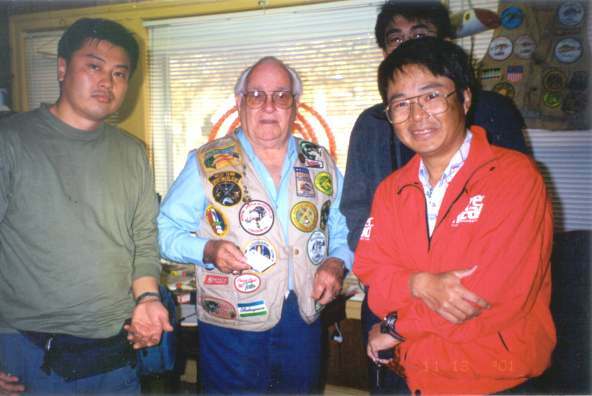 ABOVE - (left) Mr. Akira Yoshizawa "Photographer" Tokyo, Japan - (center) Mr. Clyde A. Harbin Sr. - (right rear) Mr. Go Takao, Editor "Evidence Group" Tokyo, Japan - (foreground) Mr. Hiro Naito (POB) "PRADCO Outdoor Brands" Winter Haven, Florida, USA. It is a great custom in Japan upon meeting that guests exchange business cards and gifts. 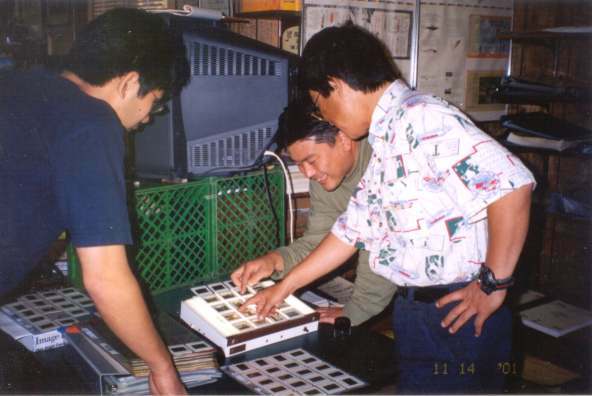 In the above photo's Mr. Harbin is receiving a business card from The Evidence Group visitors and in the following photo Mr. Go Takao displays the Bassman Executive Planner that he has received as a gift from Mr. Harbin. 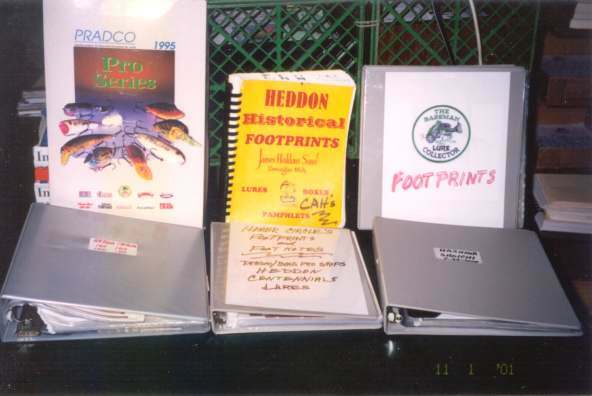 Upon receiving the request for the interview and not knowing the direction of the magazine article Mr. Harbin gathered up many of his handmade lure information books, various bass pictures, color slides of the Heddon family, color lure slides, Japanese Heddon lures gifts and Smith Co. LTD gift items for the Evidence Group's magazine article. 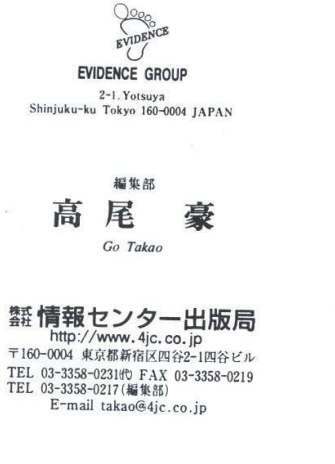 The Evidence Group could select whatever material would be needed to increase the value of the interview for publishing their magazine article for Japanese readers. The Evidence Group is viewing the many 20 slide pages with a Desk Top Light Box. 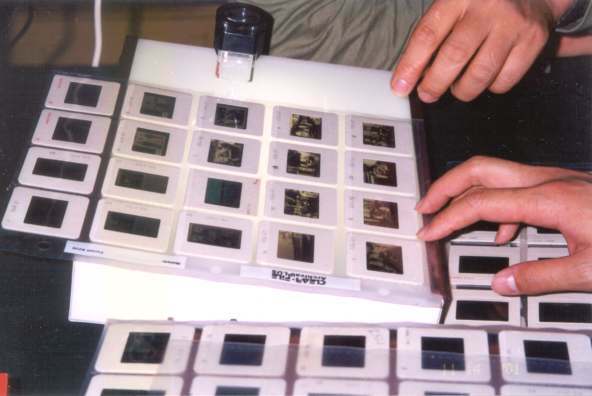 They will be selecting what slides will be used for the magazine article. 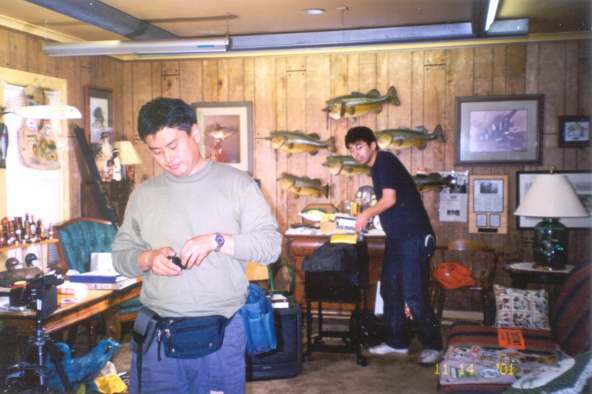 Mr. Takao is observing Mr. Naito as he surf's Mr. Floyd Roberts Antique Fishing Lures website. He is surfing through the Bassman Section and reading the four part story of "The Old Lure Japanese Story". In part IV of The Old Lure Japanese Story Mr. Lanny West wrote the background on Hiro Naito and his "Japanese Connection". 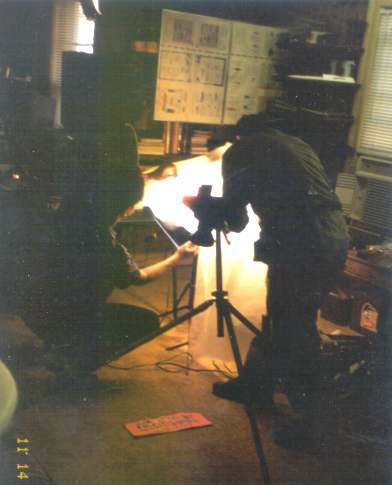 Mr. Yoshizawa arranging the flood lights to get the correct light exposure of the items selected to photograph. Note the red placard on the floor in the foreground. Each contestant was required to display this placard on their boat for the First All-American Invitational Bass Tournament. 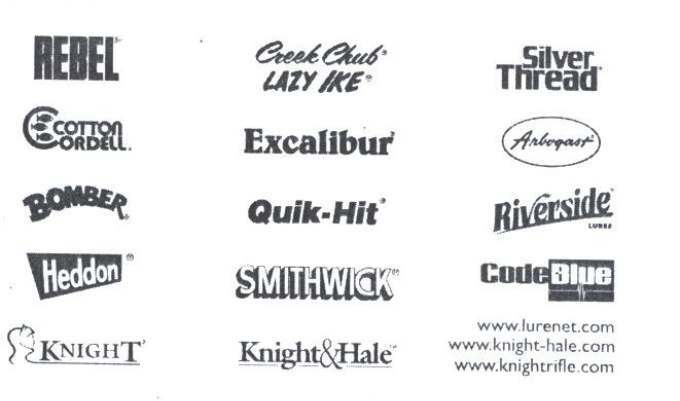 The tournament was held on Beaver Lake, Arkansas on June 5, 6, 7, 1967 in Springdale, Arkansas. Mr. Harbin (The Bassman) had removed his from his 20HP motor that he used in the tournament. 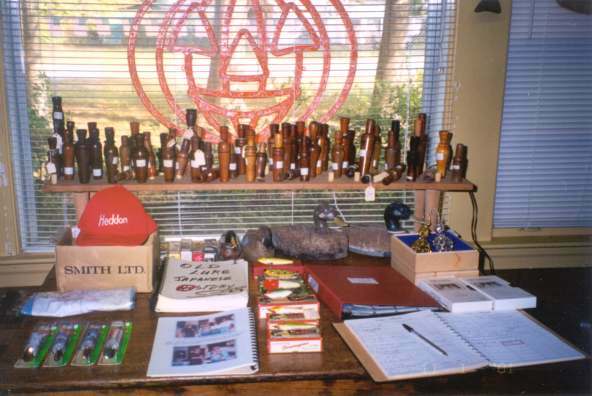 The above picture is shown in The Bassman Section on the First All-American Invitational Bass Tournament on Floyd Roberts, Antique Fishing Lures Website. 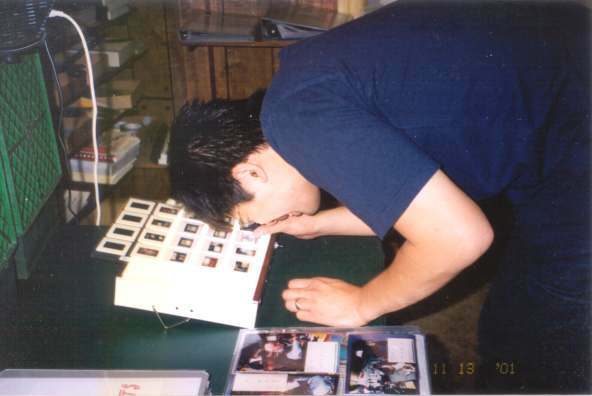 Mr. Yoshizawa and Mr. Takao are working gathering information and taking photographs of items that will be used for their magazine article. 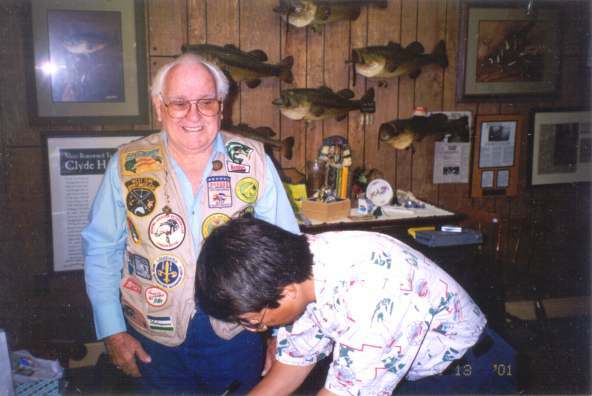 Mr. Yoshizawa and Mr. Takao are making pictures of one of the very rare 106 Heddon patches donated by PRADCO for the "1967 All-American Invitational Bass Torunament" held in their backyard on Beaver Lake, Springdale, Arkansas. 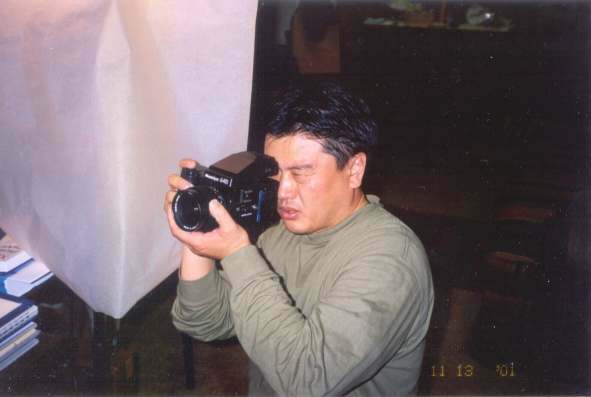 Mr. Yoshizawa is taking pictures for Evidence Group Magazine.